A very enjoyable recording, this, showcasing three diverse 20th century works which all deserve wider exposure. 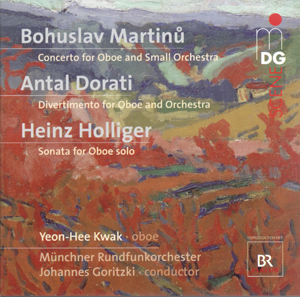 The oboe is a curiously neglected instrument in terms of solo repertoire, and the three composers on this CD seem to have come to it for three completely different reasons: Martinů was commissioned by an oboe player (Jiři Tancibudeck), and Holliger is an oboe player, while Dorati’s motivations stemmed from his sympathy for the instrument’s neglect. The Holliger Sonata is one of the composer/oboist/conductor’s earliest works. This, too, mixes lyricism and virtuosity in a range of inventive ways. And there is never a danger of the lack of accompaniment causing lack of interest. On the contrary, the diversity of tempi, dynamics and phrase structures makes for endlessly fascinating listening. A lot of the writing is high, but Yeon-Hee Kwak takes it all in her stride, and maintains an impressively warm tone, even right at the top. The impetus for Antal Dorati’s Divertimento came from an unlikely source, the Discount Record and Book Store in Washington, who commissioned it to mark their 25th anniversary in 1976. It is very much a product of its time, and shows the (productive) influence of a number of the mid-century’s greatest composers. The vibraphone in the opening calls to mind the Walton Cello Concerto, while much of the following material owes a debt to Shostakovich. The orchestration here is wilfully eccentric, and you’ll hear more percussion than you would ever expect from an oboe concerto. The work is stylistically some distance from the other works, the Martinů in particular, and the overall impression is of a diverse and satisfyingly varied programme. Yeon-Hee Kwak is a fine advocate for her instrument. I sense that she is consciously striving for a vocal sound in much of her playing, which brings a clarity to her phrasing, even in the most complex passages. The Müncher Rundfunkorchster and Johannes Goritzki accompany sympathetically but without undue restraint. I don’t think this music really stretches them (well, maybe the percussion in the Dorati) but they are able to keep up the interest and move seamlessly between the various styles and moods of this diverse programme. The SACD sound is good but not exceptional. The round, fullness of the oboe sound, especially in the top register, is the main recipient of the superior audio’s benefits. The disc comes with both Dolby 5.1 surround and so-called ‘2+2+2’ sound, the latter giving a more even surround experience when the speakers are rearranged around the room. Quite what use that is for a solo work like the Holliger is anybody’s guess.